Unfortunately, active shooter related events are a part of our modern world. Sadly, in the United States, the number of active shooter events such as the recent Florida school shooting, are on the rise. Tragically, while the media and politicians focus on firearms, they rarely if ever mention what people should do if they find themselves involved in an active shooter situation. All one has to do is read the FBI report on active shootings, to understand they can happen anywhere at any time. This increase in active shootings makes it more important than ever to understand what to do during an active shooter emergency. Not only should you learn this, but as today's Florida school shooting shows, your children should learn it as well. As a former Army Ranger, firefighter-paramedic, high threat security specialist and international security director, I’ve spent years training on and dealing with scenarios much like today’s school shooting and other similar incidents. In addition to my background, I’ve spent decades working alongside Delta Force Operators, Green Berets, Navy SEALS, SWAT team members and others. Together, with the lessons learned from these great people and my own first hand, real-world experience, I’m going to provide you with some solid advice on how to react to an active shooter situation. This advice Is meant as a starting point for you and your loved ones to increase their chances of survival should you ever be in an active shooter situation. Before we get going, it’s important to understand a couple of things. First, the odds of your direct involvement in an active shooter incident is extremely low. Regardless, it is very important to know what to do if you are. Secondly, many active shooter concepts are applicable across the situational lines of various active shooter incidents. Whether it is a Florida school shooting or a Las Vegas concert shooting, many of the concepts are the same. To start with, you should understand that active shooter incidents happen fast. 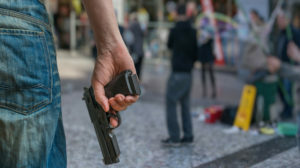 In fact, according to FBI statistics, approximately 36-percent of active shootings are over in less than two minutes, with the majority lasting less than five minutes. So, what does this mean to you? Unfortunately, it means that once an active shooting starts, you’re probably on your own. That also means, when the gunshots start, you won’t have much time to think your way to safety. The first step in dealing with a problem is to identify the problem. That means understanding what is happening in the world around you. In the military and law enforcement, this is known as situational awareness. If you’d like to know more about situational awareness, you can read up on it in our blog post on it. Once you become aware of the problem, in this case, an active shooting, your next step is to take action. Taking action means just that, T-A-K-I-N-G A-C-T-I-O-N! In other words, don’t just stand there, do something. Far too often, when people are confronted with a very stressful situation, they freeze. This often happens because of normalcy bias. Normalcy bias is the thought that a tragic event won’t happen to us. In short, normalcy bias is our brain trying to convince us that everything is alright. Well, in this case, it isn’t, so we need to act. The best way to make sure you don’t freeze up is by training ahead of time. By at least thinking things through in advance, you’ll be more likely to come out on top of a major tragedy. One way to do this is to think about possible scenarios as you go about your day. For example, what if a bad guy comes out from behind the door? What if, an active shooting happens while I’m in the library? These what-if scenarios are meant to help you react more quickly and effectively when problems happen. They also play into something the military calls, the OODA Loop. The OODA Loop, which stands for Observe, Orient, Decide, and Act is a process of taking action. By mentally or physically training yourself ahead of time, you’ll be more prepared to deal with problems when they happen. We discussed how physical and mental training help prepare you for success during an active shooter incident. So too does taking notice of the developing situation as you go about your day. Remember, we covered situational awareness earlier? In this case, as you go about your day, you want to take notice of exits. Now, those can be exit doors or pathways that should lead to safety. By maintaining awareness of the exits, you’ll be better able to move towards them if something bad happens. Don’t forget to make note of exits that are not as easily noticeable, such as backdoors, etc. Some people debate this but run, hide, fight, is a good course of action to train yourself on. It is good, because the three pillars of run, hide, fight, are easy to remember. Not only are they easy to remember, but they are often instinctual reactions to an active shooting. The best way to not get shot is to create time, distance and space between you and the active shooter. Getting away and escaping from the bad guy should be your number one priority. When the shooting starts, run AWAY from the shooter and towards safety. Don’t stop to pick anything up. As you run, warn others and help guide them to safety. Guiding people to safety, as you are running, does not mean to stop and talk about it with them. If others aren’t willing to get moving, that’s their choice. Your best action is to get away from the danger. If you are not able to escape to safety, the next best course of action may be to hide. When hiding, you still want to do your best to create time and distance between you and the active shooter. However, do so as you find and put yourself into a good hiding place out of the shooter’s view. Don’t forget, if you can quietly and quickly lock a door to your hiding place, do so. You can also turn out lights if you can do so without attracting attention. When hiding, it’s vitally important to be as quiet as possible. Make sure your phone is on silent, that includes making sure it won’t vibrate either. At this point, you may want to consider NOT calling the police. Instead, consider texting them. After all, once the shooting starts, the odds are you’ll be on your own until the situation is over. Should the bad guy hear you talking, that may be all it takes to have him put his sights on you. Lastly, when hiding, you don’t want to move until the police come and get you or give you the all clear. If you leave before, you may happen upon the active shooter, or put yourself in a bad position. Also, remember, law enforcement officers will have their adrenaline flowing. So, make sure you get down and make it completely obvious to them that you are not a threat. Keep your hands empty and visible and obey all commands from law enforcement. Fighting the active shooter should be your last resort. You’ll only want to fight during an active shooting if there are no other alternatives. As I’ve discussed many times, entering into a physical confrontation often leads to trouble for all involved. Once you decide there are no other options, then you should fight to win. If time permits, recruit others to help you. Take a quick look around and see what can be used as a weapon. Then, once you’re ready, attack the active shooter with speed and violence of action. Remember, the active shooter has a gun. Therefore, this is no time for halfhearted measures. When the time comes to fight, you will be best served by exerting the maximum damage possible, in the shortest amount of time possible. Should your efforts to overcome the shooter be successful, immediately kick (not pick-up) the gun away. Then, while making sure the bad guy stays subdued and down, make yourself as non-threatening as possible. After all, you don’t want to be mistaken for the bad guy after you already took him down. Just think about all the parties and late-night TV shows you’ll miss! If you have any other thoughts or questions about active shooter response, please leave a comment below.